For use in the poultry industry as bedding in the broiler and hen houses. 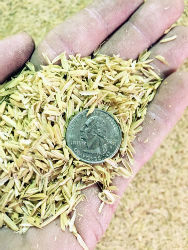 Rice hulls can be used over a layer of wood pellet shavings in animal stalls. Rice hulls are a natural, sustainable and renewable alternative to peat, vermiculite, and perlite makes an impressive growing media when mixed with compost or your favorite potting soil. Drains well and provides a good source of aeration and porosity. Traditionally, rice hulls have been used in the poultry industry as bedding in the broiler and hen houses. They absorb some moisture from the waste of chickens keeping them cleaner, longer. The old litter can be used for composting and improving soil structure. Rice hulls can be used over a layer of wood pellet shavings in animal stalls. The wood pellet absorbs the majority of the moisture while the rice hulls provide a soft cushion for animals to live on.